Shake and strain into a chilled coupe. Sugar rim optional. THE SIDECAR: to some, a brilliant, rich, and perfect cognac delivery system; to others, well, they prefer to smash a Daiquiri. As an out and out fanboy of the Daiquiri, I don’t mind admitting my affection for the Sidecar. It’s a rare opportunity to give cognac a good run, it’s refreshing, and it’s difficult to perfect, so it can tell you a lot about the bartender making it. Indeed, it’s been hard to pin down a canonical spec over the decades. The original recipe is a simple, three-ingredient equal parts drink: brandy, lemon, and Cointreau, as called for in Harry MacElhone’s 1927 Barflies & Cocktails. Sadly, in those proportions, the triple sec and lemon is way out of check, drowning the poor equal measure of brandy. Harry Craddock’s version, published in The Savoy Cocktail Book in 1930, bumped up the ratio of cognac — he specified brandy, in particular — to Cointreau and lemon juice. Note that there’s been no mention of a sugar rim; that came later on in the piece. Yeah, maybe that’s true, but then again, Embury was drinking some rather boozy drinks. We like the Sidecar we get when we hit Rambin’ Rascal Tavern. They’ve dialled back the triple sec quotient, added a little bump of sugar, and allow the richness of the Martell VSOP to shine through (without overdoing it, Embury-style). 1. Moisten the rim of the glass with a twist. 2. Rim the glass with sugar. 4. Add the dry curacao. 5. Add your Martell VSOP. 6. Add a pinch of sugar syrup. 7. Shake hard with ice. 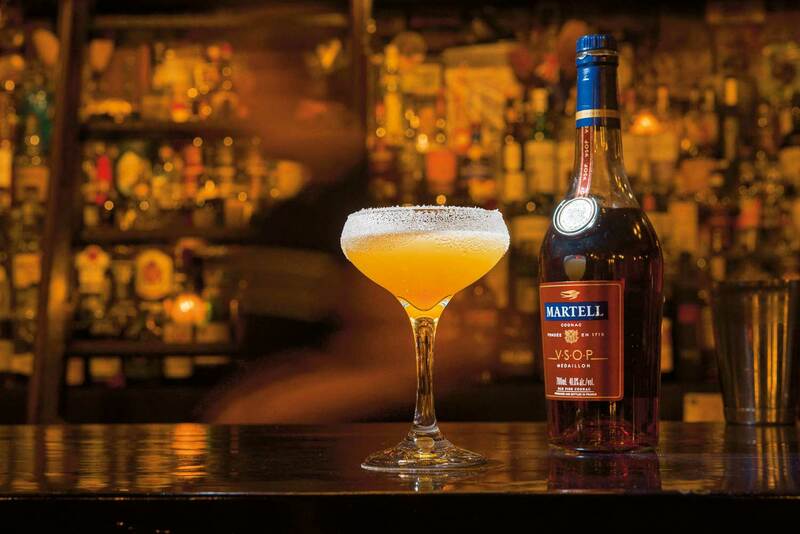 Martell is the oldest Maison de Cognac, created in 1715 by Jean Martell. He was one of the first to distil the ugni blanc of the region establishing strong collaborations with local winegrowers. Martell Cognacs are marked by balance and elegance which comes from the fact that they specialise in eaux de vie from the Borderies region. Martell is the only house who only distils clear wine without sediments. As a consequence of this choice of quality over quantity, the Martell eaux de vie are characterised by their outstanding purity and delicacy. Martell uses only fine grained wood barrels for ageing.This wood variety grows very slowly, resulting in a finer grain and soft, subtle tannins. Pouring a gold amber colour, there are notes of lime, liquorice, and quince, raisins and plums, and oak. On the palate, it’s mellow and complex, with a round body and long finish.